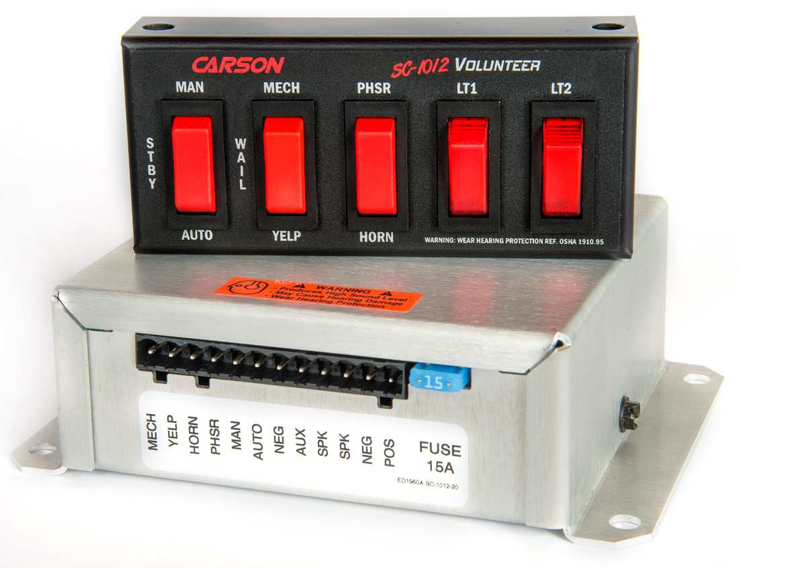 Click the button below to add the Carson SC-1012 Remote Mechanical 100w SIREN with Light Control to your wish list. The SC-1012 100-watt remote siren with light controls offers complete versatility. This siren provides flexible placement of the remote switch panel and amplifier. The remote switch panel features two separate 3-position rocker switches that allow you to select between wail, yelp, manual, and mechanical tone. The SC-1012 siren includes a momentary rocker switch for air-horn and phaser with the European HiLo/two-tone sound as an optional substitute. The Horn Ring Cycler (HRC2) function of the siren cycles through the tones with the vehicles horn to enable the driver to have hands-free. To control emergency lights the siren also includes two lighted rocker switches. The SC-1012 Remote Siren offers the reliable performance, and rugged durability with consistent quality that comes with every Carson Siren. This siren is designed to work with a 100-watt speaker and ensures you the strength to get you where you need to go and be heard like one of the big fire trucks. The remote panel may be mounted with holes in the top or bottom. The siren tones may be changed or disarmed using an internal Dip switch. An output indicator light is on the face of the remote amplifier for diagnostic purposes. The light controls are capable of switching up to 20 amps. The siren is LED backlit and is installed using heavy duty screw down terminals for power and detachable connectors for the speaker and lights and remote switch panel. The amplifier and light controls are fused separately on the back of the unit. As with all Carson Sirens products, the SC-1012 is backed by a no-hassle 5-year limited warranty.